For some of us, vacation means putting your feet up, soaking up some sun and forgetting about the responsibilities of real life for a little while. 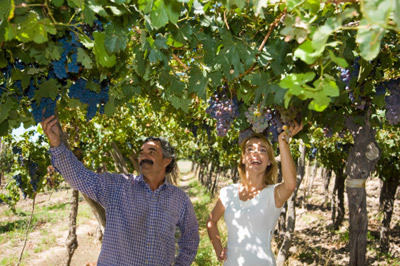 For some intrepid travellers, however, agritourism is an exciting and rewarding vacation option. Agritourism is a vacation industry built on the romantic ideal of country life. Farmers open their homes to guests (or provide accommodation on the grounds somewhere) and introduce them to the agricultural way of life. Guests are expected to help out on the farm (this could mean collecting eggs, milking cows, feeding livestock, pulling potatoes, etc.) and often you will eat home cooked meals made with the farm’s own produce. This is a hands-on vacation that is popular among city-slickers who are looking for a way to re-connect with the simpler living. There are lots of options for types of accommodation, since each farm tailors the experience to their own preferences. The Vermont Farms Association has compiled a list of over twenty farms that offer farmstays (available at www.vtfarms.org) all over scenic Vermont. In the north find farms like Couture’s Maple Shop and Farm Stay, which gives guests the run of their dairy and maple farm and puts them up in the on-site bed and breakfast overnight. In the morning, guests are treated to a full maple breakfast. At Trevin farm, set in the rolling hills and forests of central Vermont, you will milk goats and learn to make your own goat cheese before bedding down in one of the farm house’s beautiful rooms. Champlain Valley offers multiple accommodation options for those interested in staying at an alpaca farm. Choose from a small bunk house (geared for hikers and cyclists), rooms in the farmhouse or one of three converted barns, or rent the scenic cottage. You will learn to care for alpacas and other livestock (expect to see horses, goats and cows). If you’re more interested in the traditional country pastimes of hunting and fishing than you are in getting your hands dirty, there are options that allow you to experience the farm life but allow you time to enjoy more leisurely pursuits. Mountain Horse Farm in upstate New York allows guests the option of staying in a converted barn or a rustic lodge and provides 33 acres of trails for horseback riding and hiking. Even though this is a working horse farm, there is also an on-site spa and non-farming activities like wine tours, fishing and boating. Blackberry Farm, located in the foothills of Tennessee’s Smoky Mountains, is a working farm that offers five star vacations. There are farmhouse suites and cottages on the property, which produces wildflower honey, eggs, goat cheese and heirloom produce, and the two restaurants provide a gourmet, farm-to-table experience.